When "interfaith dialogue," "Islamophobia," boycott, divestment, and sanctions (BDS), and academia collide, there's a good chance that Friends of Sabeel – North America (FOSNA) will be involved. Case in point: FOSNA, the "voice of the Palestinian Christians," recently held a conference with the title, "Voices for Justice & Peace in the Holy Land" that encompassed all four factors. It took place at co-host Christ the King Catholic Church in Pleasant Hill, California, a massive complex with plenty of room for the workshops that made up the bulk of the conference. Tables displayed with anti-Israel books, leaflets, flyers, and T-shirts lined the walls of the cafeteria; approximately 100 people attended, many sporting keffiyehs, including a tall woman wearing a patchwork-style dress composed entirely of the scarves. Radical chic was all the rage. 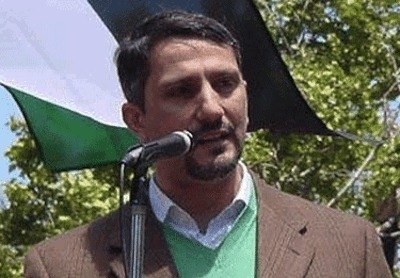 Hatem Bazian—a senior lecturer in the department of Near Eastern studies, director of the Islamophobia Research & Documentation Project at the University of California, Berkeley, and a regular at Sabeel conferences and other "interfaith" events—led the workshop titled "American Muslims and the Palestinian struggle for liberation." It focused on the alleged connection between "Islamophobia," counterterrorism, and the pro-Israel movement. We have a total of 4,300 cases; ninety percent are Palestinian [and] regarding 'material support for terrorism.' . . . Right now we are in the middle of planning another appeal on the Holy Land Foundation case, which already has cost us $5 million. However, AMP does not officially engage in legal advocacy, but, rather, "educational" efforts, rendering Bazian's claims, particularly the inflated figure of "4,300 cases," suspect. Bazian sits on the board of directors of the Muslim Legal Fund of America (MLFA), which filed a motion to vacate the prison sentences of the five Holy Land Foundation defendants in late 2013. He may have had this in mind when he made the above statement, but his numbers still don't add up, as MLFA lists only 48 cases wherein they are involved. Bazian should either verify the existence of the alleged 4,300 cases or to stop repeating this falsehood to the public. Bazian also outlined AMP's specific efforts to "put Palestine back on the agenda," including anti-Israel bus ad campaigns, "Nakba commemorations" (radicals use the word "Nakba," Arabic for catastrophe, to describe Israel's founding), and "coalition building" with the anti-Israel groups Jewish Voice for Peace and Students for Justice in Palestine. Perhaps most ominously, he noted that, "We are designing a curriculum for use in 475 Muslim schools to address Palestinian issues," a promise that was echoed by speakers at a recent AMP fundraising dinner in Chicago. Given that anti-Israel and Islamist propaganda masquerading as education has already infiltrated American public schools, Bazian's pledge should not be taken lightly. Bazian, who is listed in the Royal Islamic Strategic Studies Center's "Muslim 500: The World's Most Influential Muslims," claimed that there is a coordinated attempt in the U.S. to "demonize Muslims and create a reflexive hate, and [to] keep them out of civil society." These efforts, "gain more sympathizers for Israel's treatment of the Palestinians." He included "pro-Israeli groups" among the "major Islamophobic producers," claiming that their goal was stop "debate" on "the Palestinian issue." If that were the case, they certainly aren't succeeding on college campuses where anti-Israel academics and activists dominate the debate. Bazian singled out Investigative Project on Terrorism founder Steven Emerson and Middle East Forum president Daniel Pipes as leading figures in the "Islamophobia industry." In fact, both focus their work on the danger of Islamism, not Islam. Bazian accused Pipes of being "committed to the demonization of Muslims," ignoring Pipes's years-long contention that "radical Islam is the problem, but moderate Islam is the solution." Whether vilifying Israel's supporters, advocating for Islamists and terrorists, drumming up unfounded fears of "Islamophobia," bragging about nonexistent accomplishments, or slandering critics, Bazian's calumnies were legion. And that is exactly what many have to come to expect from the ranks of Middle East studies. When "scholars" become nothing but political activists, truth is the first casualty. Berkeley resident Rima Greene co-wrote this article with Cinnamon Stillwell, the West Coast Representative for Campus Watch, a project of the Middle East Forum. Stillwell can be reached at stillwell@meforum.org.